Our preschool provides children aged 18 months-5 years old with a nurturing, supportive, and caring environment in which to grow. Our curriculum includes age- and developmentally-appropriate activities, including instructions in Greek language and our Greek Orthodox Faith. Our early childhood instructors are New York State-licensed and our student to teacher ratio is low, ensuring personal attention. Our students and their families are encouraged to participate in all Archangel Michael programs, activities, and fellowship events, strengthening the connection between home and school. Experience with early childhood literature develops cognitive skills and encourages imagination. An auditory introduction to Greek enhances listening skills. Using drawing and finger-painting as well as sand, Play-doh, and water play, kids express and develop their creativity. Children learn shapes, colors, and the alphabet while strengthening fine motor skills. Kids express themselves through movement and music, which also offers developmental benefits by reinforcing academic concepts and fostering logical thinking. 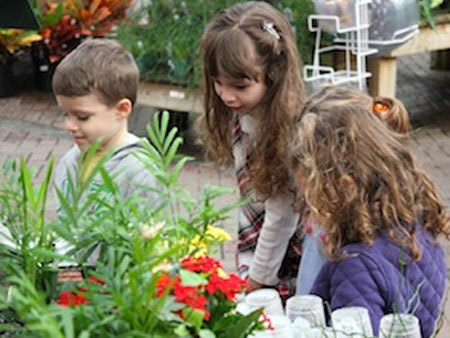 At multiple discovery stations, kids engage in hands-on exploration of the fundamentals through measuring, coooking, and studying nature. 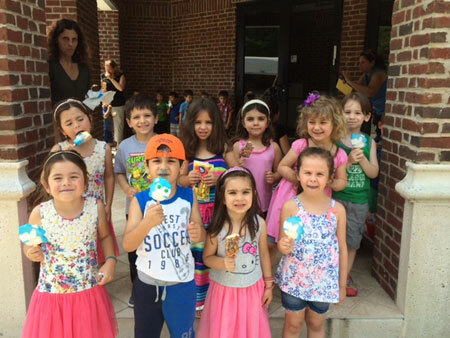 Kids feel supported and encouraged as they learn the building blocks of the Orthodox faith and celebrate major holidays. Kids have fun climbing, swinging, and sliding in the school’s new enclosed play yard. Both structured and unstructured play helps kids learn important social skills. We provide healthy foods for kids to enjoy with their friends and teachers. We are an allergy-aware preschool, so please let us know your child’s needs and preferences. We are glad to accommodate for food allergies and sensitivities. 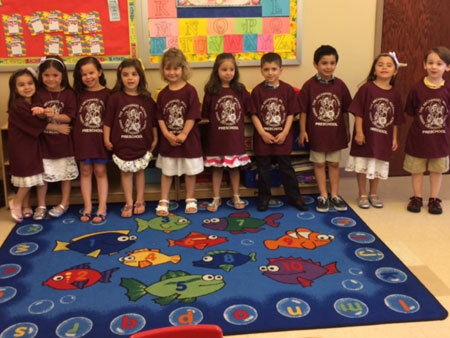 Find out how the Archangel Michael Preschool can provide your child with a strong foundation for life and learning by meeting our director, Ms. Linda Alimaris. Ms. Alimaris earned her BA and MS degrees in Early Childhood Education from St. John’s University. She also has New York State Certifications in Nursery through 6th Grade. She is fluent in Greek and can instruct English as a Second Language (ESL). Ms. Alimaris holds a New York City Teacher’s License in Early Childhood Education. Mrs. Linda Maglaras Alimaras has been the Director of the Archangel Michael Preschool since its inception in 1996. She attended St. John’s University as an undergraduate and graduate student where she earned a Bachelor and Masters degree in Early Childhood Education. She holds permanent New York State certification in Nursery–6th Grade Greek Bilingual, English to Speakers of Other Languages. Mrs. Alimaras has also been a Kindergarten teacher at the Archangel Michael Greek Language Institute for over 10 years. She was a former ESL teacher at Manhasset High School. In addition, she teaches ESL at BOCES as well as the Continuing Education Program of Lifelong Learning at Nassau Community College. Mrs. Alimaras has been a member of the Archangel Michael Church since 1991. She is married to Peter Alimaras and they have 2 children. Mrs. Jane Katramados has been a Nursery teacher at the Archangel Michael Preschool for 10 years. She is CDA Certified for ages 3 – 5. Mrs. Katramados graduated from NYIT where she earned a degree in Liberal Arts. She worked as a Research/Marketing Manager for CMP Publications for 10 years. Mrs. Katramados worked as a volunteer substitute teacher at St. Aloysius Pre School and taught religion for 8 years. Mrs. Katramados is married to George Katramados and they have 2 children. 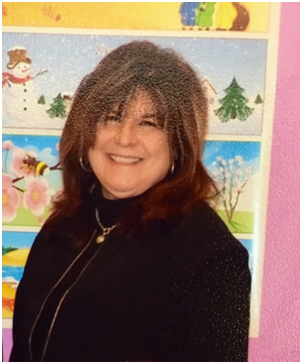 Mrs. Helen Bapis has been teaching at the Archangel Michael Preschool since 2013. She and Marianne Matarangas developed the Toddler Program. Mrs. Bapis has a Bachelor Degree in Liberal Arts from Hofstra University. She has a Masters Degree in Special Education from LIU-CW Post. She holds NYS Permanent Certification to teach Early Childhood through 6th Grade. She has taught at the elementary school level at Transfiguration Day School, PS65 in the Bronx (NYC Public School) and St. Sophia Hellenic Orthodox School in Salt Lake City, Utah. Mrs. Bapis is married to Michael Bapis and they have two daughters, Maria and Georgia, who are both graduates of the Archangel Michael Preschool. She is currently a HOPE/JOY Advisor, Greek Dance Troupe Coordinator and President of the Greek Language Institute Board. Her family continues to be involved in the Archangel Michael Greek Orthodox Church. Mrs. Roula Zogopoulos has been an educator at the Archangel Michael Church since 1999. She is currently teaching the Pre-K class at the Archangel Michael Preschool. She has previously taught the Toddler group as well as Dance and Movement at the Preschool since 2015. Mrs. Zogopoulos is also the Archangel Michael Greek Dance Troupe Artistic Director as well as the Greek School Dance instructor at the Archangel Michael Greek Language Institute. 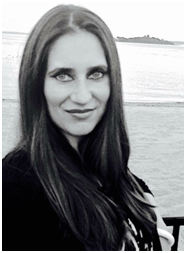 Mrs. Zogopoulos earned her Bachelor’s Degree in Drama, Theater and Dance as well as Sociology from Queens College. She then earned her Master’s of Teaching Degree in Elementary Education from Queens College. She began her classroom career in the NYC Department of Education having taught in public school as an early childhood teacher as well as a dance educator (Pre-K through 6th Grade). 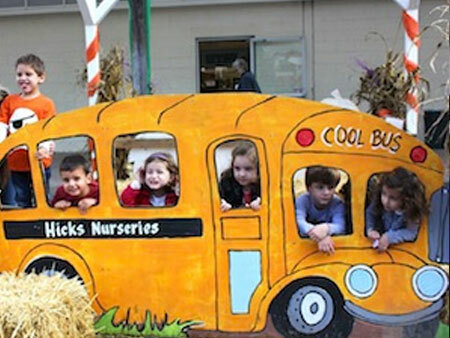 Her extensive classroom experience and her dance background afford her the opportunity to create a rich, fun, interactive, hands on, creative and educational preschool curriculum/experience. She prefers the loving and intimate private school setting that the Archangel Michael Preschool provides. 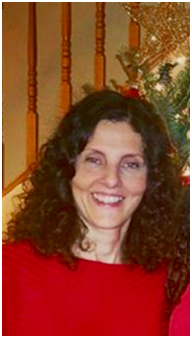 Mrs. Zogopoulos is involved in pediatric charity work, working closely with the Ronald McDonald House of NYC, the Greek American Mother’s Association and the Cura Orphanage of Kenya where she donated all the gently used AMC basketball uniforms to the children of the orphanage. She is happily married to Chris Zogopoulos and they have two sons, Yanni and George. Mrs. Georgia Yioupis has been working as a Teacher’s Assistant at the Archangel Michael Preschool since 2014. She has been a substitute Teacher’s Assistant in the Port Washington School District. 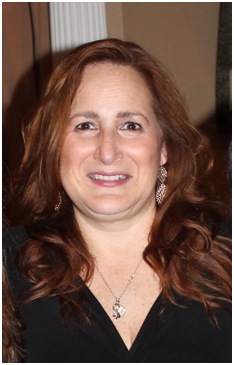 Mrs. Yioupis also has experience in the banking industry working at Marathon Bank for 10 years. 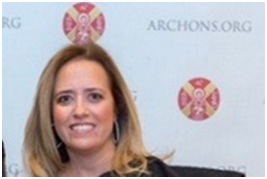 Mrs. Yioupis is married and has two children, Nicole and James, who have attended Archangel Michael Preschool, and were active in both Archangel Michael Church HOPE/JOY and GOYA programs. 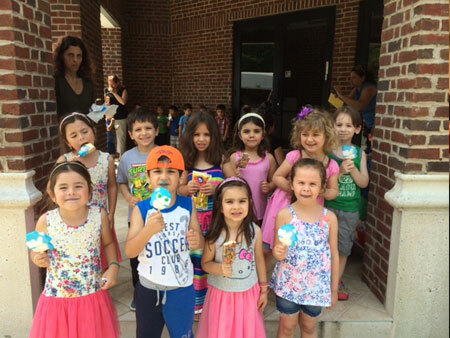 Mrs. Alexandra Zarb has been working as a Teacher Assistant at the Archangel Michael Preschool since 2017. 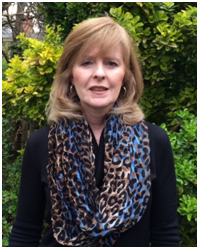 Mrs. Zarb has a Bachelor Degree in Liberal Arts (Communications and Marketing) from Adelphi University. She has a Masters Degree in Elementary Education (Pre-K through 6th Grade). She worked at a number of radio stations in New York for 10 years in sales and marketing. From 2004 to 2011, Mrs. Zarb was the Pre-K Teacher at the Archangel Michael Preschool. Previous experience includes substitute teaching in Farmingdale and Levittown Schools. Mrs. Zarb has been a member of the Archangel Michael Church since 1995. She has 2 daughters, Amanda and Elizabeth, both alumni of the Archangel Michael Preschool.